Samsung un55ju6700fxza is a 4K UHD Smart curved LED TV with ample features. Like Smart TV offerings, a Quad core processor, UHD Picture Dimming and a contrast enhancer. It comes with a curved screen design along with an upgraded smart remote controller. This Samsung un55ju6700fxza has a wonderful design with a thin half inch border around the curved frame. Equally, the screen is 5.2″ in depth without the stand. The curved design helps to compensate the poor viewing angles associated with LED TVs. The stand is T-shaped and brushed silver for this ju6700fxza. Flat panel mount interface is 400 x 400 mm. Features include Samsung smart touch control and built-in microphone. This Samsung LED TV has an excellent picture quality. The images are clear and the color information is also accurate in this TV. Similarly, the ultra clear panel technology present in the screen helps in the absorption of the ambient light. Besides, an added feature includes a wide color enhancer plus technology (for an expanded color pallet). Upscaling quality is an important feature in the 4K UHD TV. Samsung un55ju6700fxza curved led 4k ult can understand the incoming signals. Applies video noise reduction techniques and scales up the lower resolution signal. Besides, it is capable of improving the picture quality detail by 30%. This is one of the best characteristics of this Samsung un55ju6700fxza model. But some users complain that this feature can result in screen uniformity issues. In this case, you may turn down the backlight setting (seen in the picture settings menu) down to a reasonable level. Probably, around 80% is recommended by the manufacturers. Samsung un55ju6700fxza TV offers an excellent user interface and intuitive navigation. The On TV page allows for individual logins. Thus, different members of the family can have different recommendation settings. This is an added plus for a home with multiple TV users. Alternatively, the smart hub for this model includes a full web browser. The inclusion of Quad-Core Processor increases the speed of the Smart TVs browsing and function. This is a welcome addition. Since processing speed and multitasking speed were slow (before the up gradation of the quad-core). Another compromise for a lower price! The panel refresh rate is 60Hz for this model and the backlight manipulated motion rate is 120. There is a built in Wifi, plenty of HDMI inputs 4 and 3 USB inputs, the un55ju6700fxza is DirecTV ready for 4K content. Along with mobile to TV mirroring and Game Picture Mode for gamers. So, are you thinking that what’s the upcharge for this curved screen? Not too much! The product is very affordable and handy. It comes at a normal rate of $1400. Further, you may look into the product’s website for more details. 4K resolution at full 60hz refresh rate (with 4:4:4 chroma). Where to buy Samsung un55ju6700fxza? You may buy the product from amazon.com. It is available at a cheaper rate with special discount offers. Amazon offers anytime gift cards for an amount of $10-$2,000. 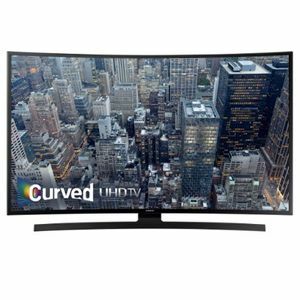 You can save 43% off on this Samsung un55ju6700fxza curved TV. Including free shipping and 30-day return policy. Other benefits include free tech support for 60-days (from the date of delivery). Similarly, one can log in with their email address for all the updates on the various deals and offers at amazon. Is the product available at Walmart? Yes, the un55ju6700fxza model is available at Walmart. Are there options to connect Bluetooth headphones to this TV? Yes, you may connect Bluetooth headphones to this TV set. How to open the remote for placing the batteries? On the back side, there is an arrow. You have to slide it from front to rear side. Where is the headphone jack located on this Samsung un55ju6700fxza? It is positioned on the back side of the unit. i.e on the upper left-hand side. Is there any DVD player built in this model. No, there are no such built-in DVD player or Blue-Ray on this model. What about the wall mount? Does the set come with it? Yes, there is a wall mount in this set. Which camera should be used to connect to this TV? Can I use any USB webcam? Yes, there are options to use any USB camera.